Eric N. DeLony, who served as Chief of the National Park Service’s Historic American Engineering Record (HAER) from 1987 to 2003, died on October 23, 2018, after a long struggle with Alzheimer’s disease. Over his career, Eric became known as a pioneer in historic bridge documentation and preservation and one of the nation’s leading experts in historic bridges. Eric was a longtime member of the Society for Industrial Archeology (SIA) and developed the SIA Historic Bridge Symposium beginning in the early 1980s to allow experts to share research and preservation experiences. His detailed drawing of the Troy Gasholder remains the logo of the Society for Industrial Archeology to this day. In recognition of his achievements, Eric was the recipient of the 2000 General Tools Award, the highest honor bestowed by the Society for Industrial Archeology. In recognition of Eric’s contribution to the SIA and the field of Industrial Archeology, the SIA Board has decided to rename its grant program in his honor: the Eric DeLony Industrial Heritage Preservation Grant Fund. To make a contribution to this fund in memory of Eric, visit the Donate page on the SIA website: http://www.sia-web.org/membership/donate/ or contact SIA headquarters: siahq@sia.org. 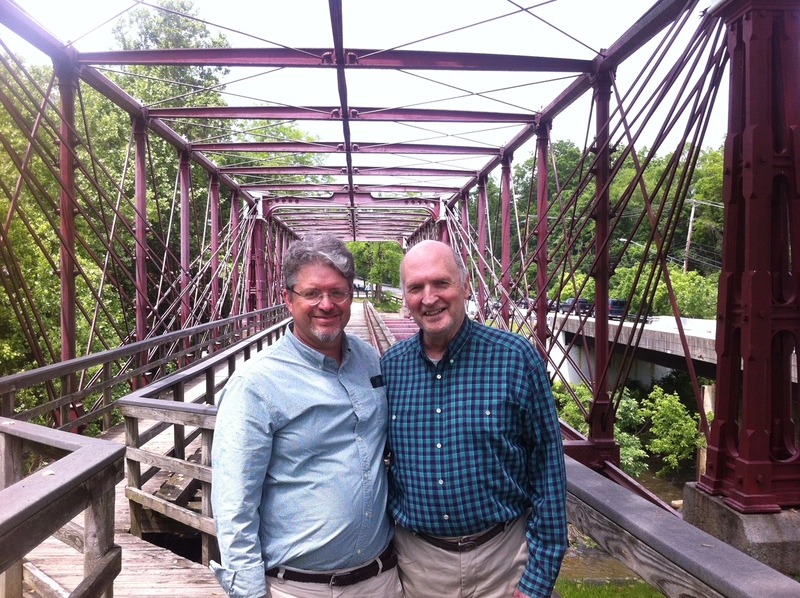 Eric DeLony (right) with current SIA President Christopher Marston at the Bollman Truss Bridge in Savage, MD in 2014. Photo by MaryAnn Naber.